[Image: Art ©Peter Garfield/Licensed by VAGA, New York; from the New York Times]. The New York Times Magazine published another issue on the state of Real Estate this past weekend. Some highlights include the above image, by Peter Garfield, used to illustrate an article about the housing bubble, and whether or not that bubble really exists – including a brief look at Robert Shiller's "housing futures" market, traded on the Chicago Mercantile Exchange. But why not a landscape futures market...? 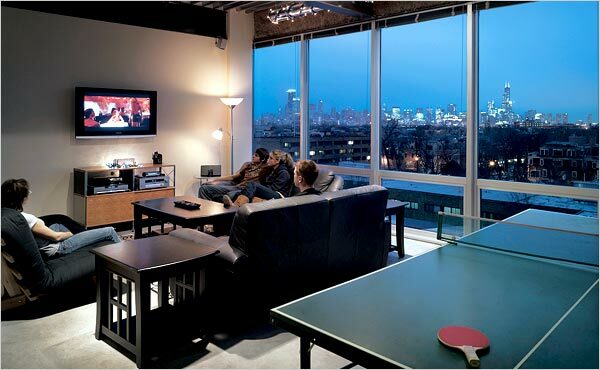 The N.Y. Times then takes a look at crazy dorm rooms – most notably at DePaul University, in Chicago – where students can expect "loft- and villa-like settings, private bedrooms and baths, professional-style kitchens with granite countertops, weekly housecleaning services, plasma-screen TVs, wireless and high-speed Internet connections in every room, fitness centers, swimming pools, even hot tubs and tanning booths." All of which differs rather fantastically from my own experience of dorm life, which involved living on the 9th floor of a 10-floor high-rise called "Hinton James," with a roommate who drank huge amounts of Mountain Dew till nearly one o'clock every morning, had a poster of Top Gun above his bed, and wanted to run for President. [Image: A dorm room at DePaul, as photographed by Nikolas Koenig for the New York Times]. There's also a longish history of home renovation and house-flipping shows, as recounted for us by Rob Walker. Walker opines that, whilst these shows may be entertaining and sometimes even quite thorough in their economic analysis of a given home improvement scheme, "much is left out. Buyer’s remorse, for instance, never materializes. Almost all of the property shows avoid one of the screaming issues of real-life real estate, which is the neighborhood. No one mentions crime statistics, lousy school systems or proximity to homeless shelters or Superfund sites." Goa, like much of India, is in the midst of a real estate frenzy, and Patrao, a man nearly 60, a veteran of the construction business in California and New York, is nothing if not an entrepreneur. His ambitions were fueled as much by his canny business sense as by Goa’s enticements. The houses he imagined building would sell for at least $180,000, he reckoned, or more than twice the investment in the land and construction costs. Real estate, he figured, was the way to go in India. “One billion people. Limited land supply. It’s a no-brainer,” he concluded. Back in the U.S., a man who looks remarkably like a young Dabney Coleman wants you to be rich – and, at least in the case of myself, I heartily agree. We're then meant to contemplate whether Richard Meier has designed a Brooklyn condo tower that "will be compared to Modernist masterpieces"? 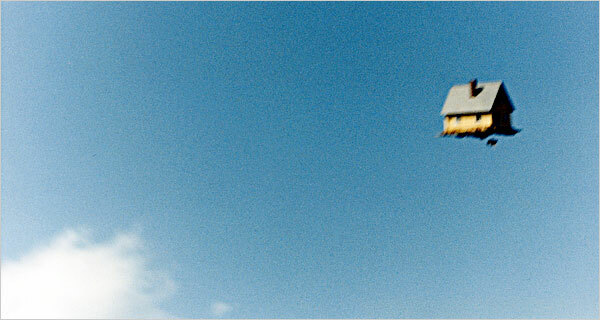 But if you mean compared favorably to said masterpieces, then BLDGBLOG would say: nope. But don't let that stop you from reading the article. 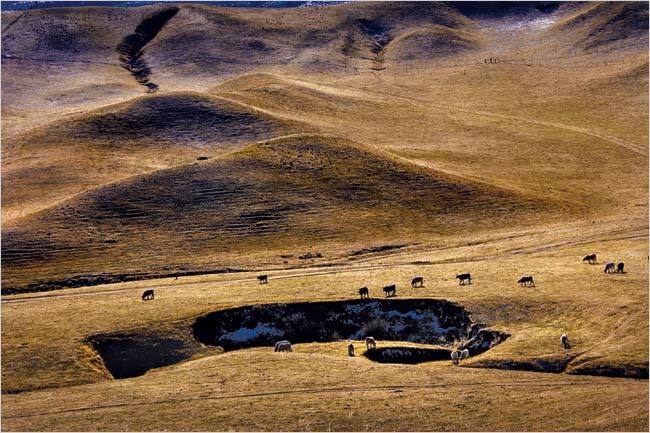 Finally, at least for the purposes of this round-up, there is a frankly unbelievably interesting article about the Tejon Ranch, located 60 miles north of Los Angeles. 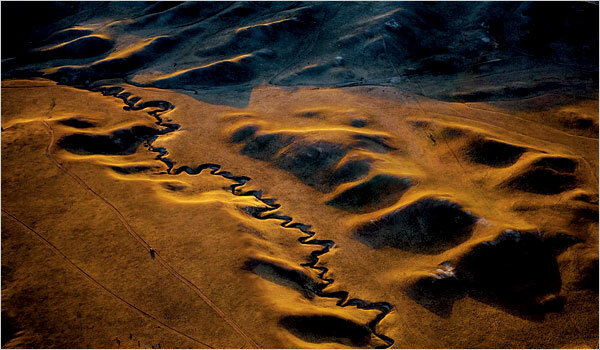 [Image: Tejon Ranch from the air; photographed by Vincent Laforet for the New York Times]. The ranch survives from the 19th century and is "roughly one-third the size of Rhode Island," but it may soon be broken into smaller parcels for the construction of a future instant suburb called Centennial – where Huxley-esque corporate land use planners are "engineering a balanced society, mainly through the use of real estate prices." [Image: The land of Tejon Ranch, where there may soon be suburbs; photographed by Vincent Laforet for the New York Times]. It's a great article, actually, and seems to encapsulate, in its own abbreviated way, a lot of the arguments going on right now about land use in the United States, from Brand Avenue and Joel Kotkin to James Howard Kunstler. You've got questions of infill, sprawl, demographic change, resource depletion, the environment, transporation, regionalism vs. localism, and even centuries-long economic shifts from agriculture to domesticity. "Nevada and Arizona may still build one new city after another," we read in one pithy formulation. But "Los Angeles will thicken more than it will spread." In any case, check it out if you get a chance. The Center for Biological Diversity has a website entitled Save Tejon Ranch and is trying to do just that. The photo gallery alone is enough to convince me that this space should be protected from the animal which is LA Sprawl. 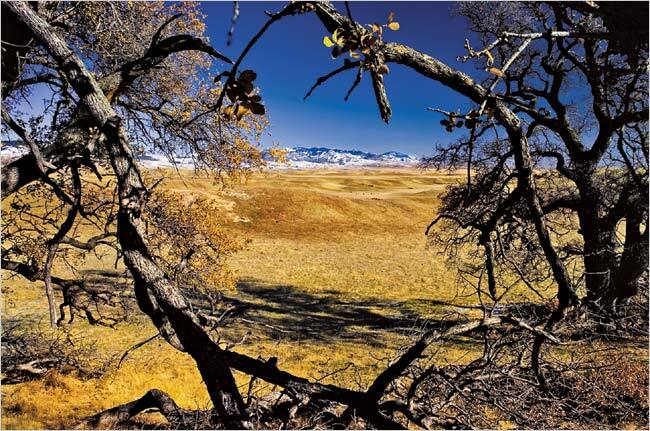 The group does not intend to stop development but to to preserve the biological, agricultural, scenic and cultural resources of the Tejon Ranch through science-based planning that is comprehensive and inclusive. You went to UNC, didn't you Geoff? Ahh, the dew! And the delights of Ho-Jo. You know it's all been redeveloped since then yes? Hey Katie - I did, indeed. And I've been back a few times since then, through that part of campus, and I've seen how many new buildings there are - which is about a dozen! - but I couldn't tell if the dorm towers themselves had been changed, or rehabbed, or anything like that. Or slated for demolition... Any internal changes to report? And I assume you went there, too? Or you live down there? I can't believe that about the dormitels. As if the cost of education isn't enough as it is. Who could afford that? And what kind of a letdown will those kids have when they graduate and learn that in real life they won't be living quite so well. Unless their parents subsidize their post-college living arrangements, as well.